So, many times we sit at our desk and we are looking for a snack. So what do we do, we head to the nearest shop and buy something that is probably not good for us. 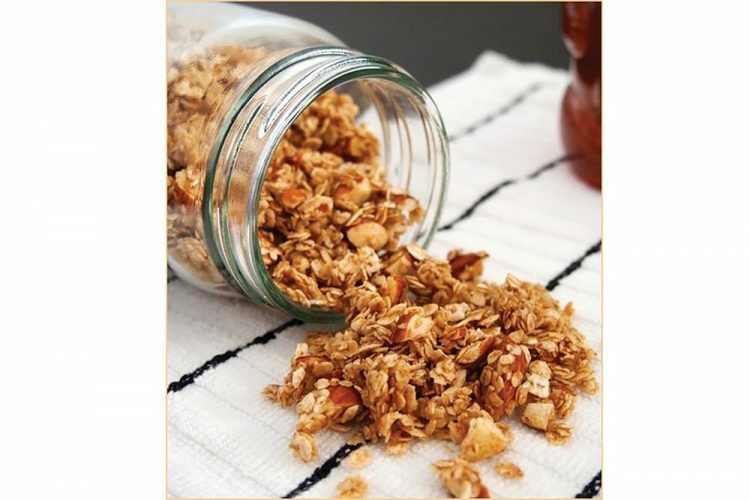 This being my story as well, I decided to make a snack that is tasty and healthy and granola is a delicious option. I hope you make a batch soon. Next week I will tell you how to make granola bars. Preheat your oven to 275˚. In a large mixing bowl combine all the dry ingredients. In another smaller mixing bowl, combine the wet ingredients. Then add the wet to the dry and toss until the granola mixture is well coated. Spread the mixture evenly on rimmed baking sheets. I used one cookie sheet per batch; you want the granola about 1/ 2â thick or so. Bake the granola in the oven for about 40-50 minutes, tossing every 10 minutes, so it browns evenly. If you donât want it too dry out too much, then reduce time to 30 minutes. Once sufficiently dry, remove from the oven and allow to cool completely on the trays. Once cool, store in a sealable container or bag. Variations: You can add 1/2 cup of apple sauce and reduce the honey to 1/ 4 cup. For additional fruits and nuts, add in 1/4 cup portions. If the mixture seems too dry, you can add more apple sauce or honey, but you want everything just coated, not soaking wet. Tips â Substitute honey with 3/4 cup maple syrup.